"The bicycle industry thrived in the United States at the end of the 19th century. As many of ten percent of all Americans owned a bicycle. In 1896, 250 bicycle factories manufactured around one million bicycles in the USA - nearly half of total world production." "1896 was the year in which cycling soared to a height of popularity among the middle classes of the motherlands of cycling. Britain and France had about a million cyclists each, Germany had half a million, and estimates from the USA range from two to four million." 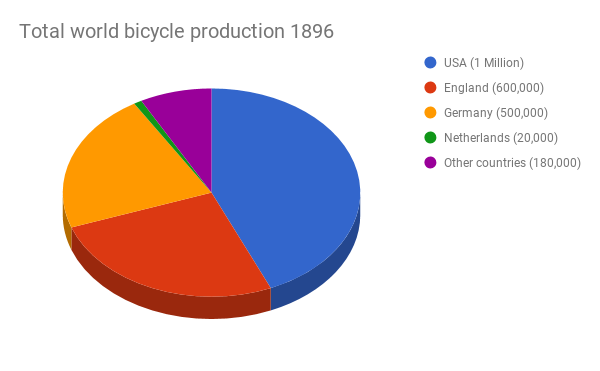 At the beginning, the Netherlands was rather behind in bicycle usage. The first cycle path in the Netherlands was built quite early but the organisation behind it came into existence only after an Englishman who moved to the Netherlands found there wasn't an existing club to join. Once upon a time, the USA was the world leader in cycling. Many of the features of Modern Dutch utility bicycles can be seen on the bicycle to the left, made in the USA in 1904, and now displayed in an excellent bicycle museum here in the Netherlands. The Netherlands was quick to embrace the bicycle, but as you can see, it was not always the case that it was a leader in cycling. After the Second World War, policy in the Netherlands became dominated by catering for motor vehicles. In some places, existing cycle paths were removed to make more space for cars. The cycling rate in this country dropped precipitously, and the downward spiral would have continued had it not been turned around after protests which were not about 'cycling' but about the safety and rights of children. Many places in the Netherlands were transformed twice during the 20th century: First to accommodate motor vehicles and then to exclude them again (1 2 3 4). The Netherlands' modern day success in cycling came not by accident or because "the Dutch have always cycled". Rather, it came through continued deliberate effort in policy, campaigning and infrastructure design. The first paragraph is paraphrased from page 12 of the Dutch Bicycle Master Plan 1999, one of several interesting documents linked to from here. The second paragraph is similarly paraphrased from page 122 of "On Your Bicycle" by Jim McGurn. The USA still buys plenty of bicycles, about 18.5 million in an average year (or one per 15 persons), and about half are adult-sized. There is likely a functional bike for every person in the country. Unfortunately, most are languishing in storage. Perhaps the USA lost its way when Wilbur & Orville Wright decided to stop making bicycles and invent the aeroplane instead. Now we have millions of people making pointless journeys, and burning millions of tonnes of carbon, so that they can visit microcosms of their own countries in the Costa del Sol, or completely fake reconstructions of London Bridge or the Arc de Triomphe in Orlando, Florida. As they say "that's progress"! Interestingly, most places in Britain were also transformed twice in the 20th century: once to build the bypasses of the 1930s and 1960s, and again, to build more bypasses in the 1980s-1990s. Classic case: Newbury. By-passed in 1963 and again in 1997. This just goes to show that there has been billions of lost investment in cycling infrastructure, whilst motoring has been accommodated repeatedly. We are now bearing the costs. Paul - "burning millions of tonnes of carbon . . ."
Burn a piece of paper. See that black stuff that's left over when the stuff that burns is gone? That's the carbon. Paper is not a carbon, it is an oxidized hydro-carbon; i.e. - sugar. So are fatty acids.